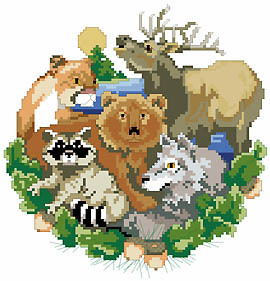 A wreath of acorns adorns this lovely design of forest animals. You see a cougar, a bear, a buck, a raccoon, and a wolf decorating the wreath. Moonlight casts a soft shadow across the lake in the background. You can almost feel the cool fresh air of the wilderness when you look at this design, PDF Download - Friendly forest creatures gather in this cozy little pattern! Contents: Stitch Count 103w X 107h Finished size on 14ct: 7" x 8"